Take the family on an unforgettable trip to Okinawa Churaumi Aquarium, a vast undersea world teeming with whale sharks, rays, corals and tropical fish. Watch aquatic shows, learn about Okinawa’s marine life and touch a starfish. The aquarium has 77 tanks spread out over four floors. Start on the fourth floor by looking down into the large, open Coral Sea Tank. Try to spot some of the sea creatures that live there, including spanner crabs that spend a lot of time buried in the sand. Visit the Touch Pool on the third floor and reach out and touch sea cucumbers and starfish. The aquarium is famous for its Kuroshio Sea Tank located through the second floor to the first floor. The enormous container is 89 feet (27 meters) wide, 115 feet (35 meters) long and 33 feet (10 meters) deep. Through the large acrylic glass panel, you can see whale sharks, zebra sharks and manta rays. Learn about life at the bottom of the ocean by visiting the exhibits on the first floor. Observe creatures that glow in the dark and see the giant squid specimen that is more than 20 feet (6.35 meters) in length. Throughout the day, you can listen to free informative talks about ocean life, and watch sharks and rays being fed. Okinawa Churaumi Aquarium is open every day except the first Wednesday and the following day of December. Admission charges apply with discounts for a group with more than 20 people and reduced cover after 4 p.m. After your visit, watch a free dolphin show at the nearby Okichan Theater and view more porpoises at the Dolphin Lagoon. Visit the aquarium’s official website for details of fees and events. Okinawa Churaumi Aquarium is located in the Ocean Expo Park complex within the Motobu District. It is a 2-hour drive from Naha Airport, and you can park in the on-site free lot. You can also reach the aquarium by bus, which takes about 2.5 hours from the airport. When organizing your day out, you might want to think about purchasing an Okinawa: Churaumi Aquarium, Butterflies & Pineapple Park or a Sightseeing Bus Tour with Okinawa Churaumi Aquarium & Nago Pineapple Park. If you're seeking even more activities, check out our Motobu things to do page. 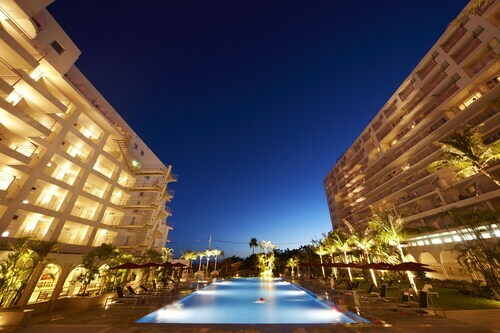 Located in Bise, this luxury hotel is within a 10-minute walk of Emerald Beach and Okinawa Churaumi Aquarium. Ocean Expo Memorial Park and Okichan Theater are also within 15 minutes. 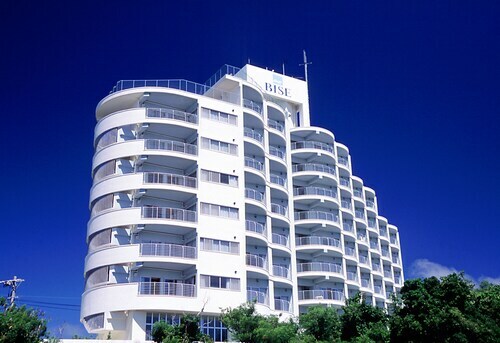 Located in Bise, this hotel is within a 10-minute walk of Ocean Expo Memorial Park and Okinawa Churaumi Aquarium. Emerald Beach and Motobu Genki Village are also within 2 mi (3 km). 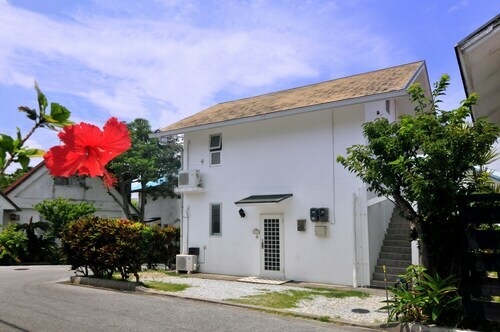 Situated in Motobu, this apartment building is within a 10-minute walk of Ocean Expo Memorial Park and Okinawa Churaumi Aquarium. Okichan Theater and Tropical Dream Center are also within 10 minutes. Situated near the beach, this apartment building is within a 10-minute walk of Ocean Expo Memorial Park and Okinawa Churaumi Aquarium. Oceanic Culture Museum Planetarium and Tropical Dream Center are also within 10 minutes. 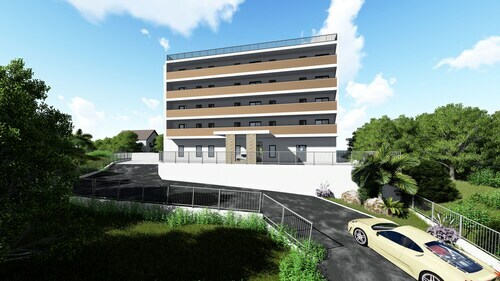 Situated in Motobu, this condo building is within a 5-minute walk of Ocean Expo Memorial Park and Okinawa Churaumi Aquarium. Oceanic Culture Museum Planetarium and Native Okinawan Village and Omoro Arboretum are also within 10 minutes. 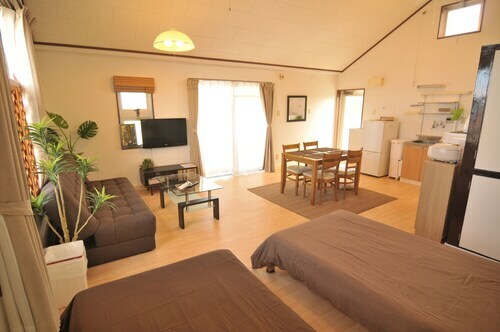 Situated near the beach, this condo building is within a 15-minute walk of Okinawa Churaumi Aquarium and Emerald Beach. Motobu Genki Village and Sesoko Beach are also within 6 mi (10 km).